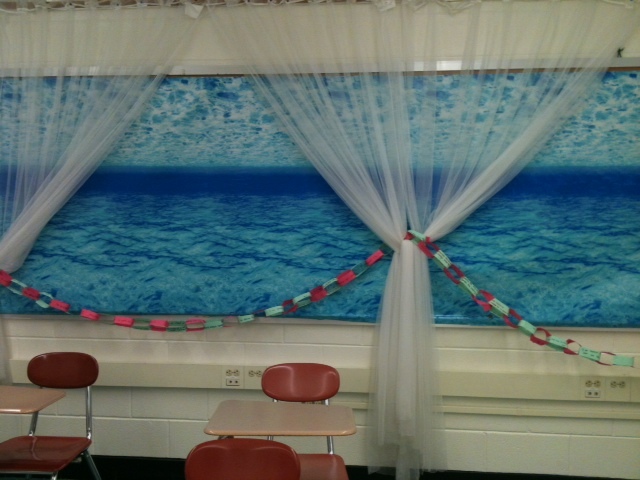 I was delighted to see this beautiful and innovative way that a high school English teacher had decorated her classroom. The actual windows offered a few a nothing more than the roof of the next wing of the building, and a tiny patch of sky. But the teacher had taken one wall and covered it to look like a view of the sea, complete with filmy curtains tied back with colorful paper chains. It reminded me of how important it is to include beauty in the places where we live and work. So often we think only of the practical, utilitarian aspects of our home and office, forgetting that a sense of beauty can increase our creativity, productivity, and generally improve our health and well-being. And while you may not be able to have a fabulous view of the ocean or the mountains, even a patch of sky or a view of some trees can make your work more pleasant. My desk faces a window, and far from being distracting, I find it restful on my neighborhood. What beautiful touches can you add to your work areas? ← What Makes a Great Book?